I was surprised at how much I enjoyed this book. It was a great piece of speculative fiction. Broken has the imagination of a Scott Westerfeld novel, the emotions of a romance novel, and the world building of a fantasy novel. Broken takes place in America in the 2100s. There are superheroes in the world, called extrahumans. Humans and aliens alike have populated other planets and the stars across the galaxy. Humans have perfected interstellar travel, and can travel from colony to colony across the galaxy. Earth is ruled by one goverment, based in Australia, which is the outcome of a world war. After the alien invasion, some humans have developed superpowers, thus the existence of extrahumans. The extrahumans are all kept together in the Union Tower and are used to do the government's dirty work. Broken is one such extrahuman. She escapes from Union Tower and is living in the streets when she meets Michael, a teenage boy who can see people's future when he looks into their eyes. Michael is caring for a baby whose mother hands the baby to him before committing suicide. The baby, whom he and Broken end up naming Ian, will either save the world or bring it to its ruin. Michael and Broken start a pilgrimage towards the future, away from the Black Bands, the enforcers of the totalitarian government. The entire book details their journey, and the people they meet along the way. 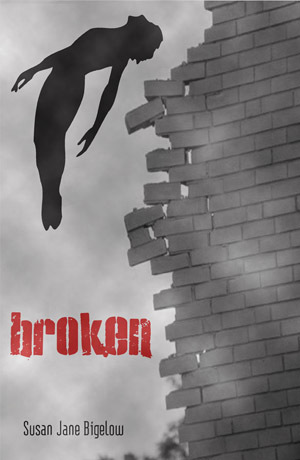 I would recommend Broken to fans of YA and fans of dystopia. It was a great read that I think nearly everyone would enjoy! I would have liked to know more about the man at the end of the story. Who is he? Is he a good father? The ending left me with a couple of questions. Most likely. There are two sexual references, but nothing overt.